Yes, I’m sure you are. Nevertheless, why hadn’t I checked with the travel agency about seats for the kids? What was the US statistic? Children restrained in car seats are 60 percent more likely to survive in a car accident. Car seat availability hadn’t even crossed my mind as agents at Flight Centre seduced me with brochures displaying photos of the standard emerald green rice terraces; graceful, smiling dancers; blazing sunsets; ornate temples; bargain prices and the fact we could book a hotel complete with a water slide. Kid-friendly, indeed. It wasn’t Disneyland kid-friendly, but that was the point. We could always ride tea cups and hang out with Pirates, or mingle with Micky and Minnie, but who needs a Small World? This was Bali, after all. “Really, Steph. They will be fine,” Kurt said, knowing I was quietly freaking. “You heard Waylan. There are no car seats. We’re in Southeast Asia,” he added. “Seriously, you just have to let go of it.” He was right. What could we do? Stay at the airport for one week? Plenty of kids around the world rode in vehicles without car seats — probably even in Sweden since Volvos are so safe anyway. It felt good to get in the van despite it having no car seats. There may not have been restraints for the kids, but there was a very efficient air conditioner. I reached between the seats, searching for seat belts to at least buckle everyone up. However, seat belts, too, were MIA. I clamped on to both Eddie and Kasey with a deathgrip. 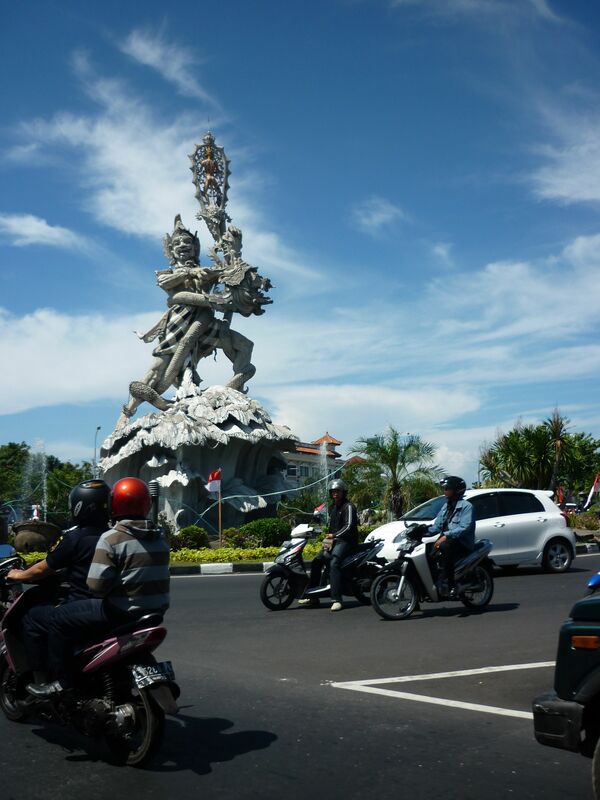 On our way to the mountain city of Ubud, we stopped at a busy Denpasar intersection. Tentacles of traffic, consisting mostly of scooters and mopeds, converged into a disjointed stop. I looked over to see a family of four pancaked together on a scooter. The parents were dressed in full ceremonial garb. The mother wore a beautiful lace top and carried a large wooden bowl of rice on her head. Both the mother and the father wore colorful sarongs and plastic flip flops. A baby was positioned up front near the handlebars with the dad, who also sported a small silk turban. At the rear, a little boy sat steadying a caged rooster. The cage was jerry rigged to the back of the scooter with a frayed rope. Car seat? Who needs a car seat? At least the van encased us in metal. Just having the extra steel of the vehicle’s frame suddenly seemed like the ultimate safety measure. When the light changed, our traffic tentacle swerved to avoid a group of scooters stopped in the middle of the road. A girl, who, presumably, had been zipping along on her moped, was down. More riders surrounded her. Were they trying to help her? No, they beeped at her while she attempted to pick her scooter up. I bottlenecked for a few more minutes to see if she had gotten up intact, and then I felt a warm liquid flowing over my thigh and into my lap. I looked down at Kasey who was hurling. At least I could hold her in my arms. A car seat certainly would have gotten in the way of her vomiting in my lap. What was my problem? This is the way they do things in Bali. I’d traveled enough to know that safety standards varied around the world. Furthermore, because vehicles are so expensive in Bali, car seats probably aren’t heavily promoted in the first place. So I was the problem. Neurotic Mom. Motherhood had never felt natural to me – especially in the beginning. After having Eddie, my goal was simple: keep him alive. If bonding took place in the process, great – it was a bonus. However, leaving the Denpasar city limits, it was easy to let go and forget about parenting issues or any other problems, for that matter. We passed scenes of daily life on the Island of the Gods. Workers, wearing the iconic conical straw hats, permanently hunched over and picked rice in the ceaseless paddies. Cows ambled unattended on the side of the road. 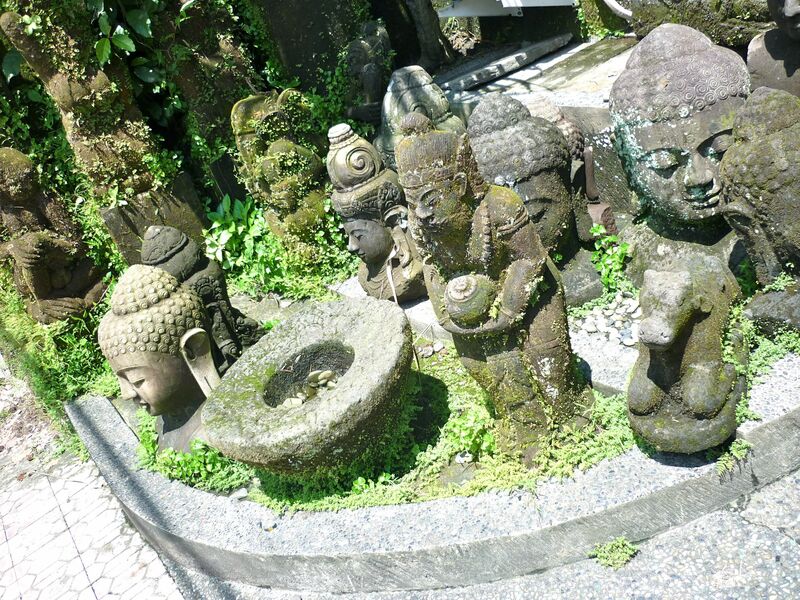 Closer to Ubud, open garages stored rows of cement Buddha heads and stone statues of Hindu deities, which all awaited transport to various markets. Meanwhile, another statue of a dragon-like Hindu god, draped in black and white checkered silk, was stationed next to an ATM vestibule outside a grocery store. 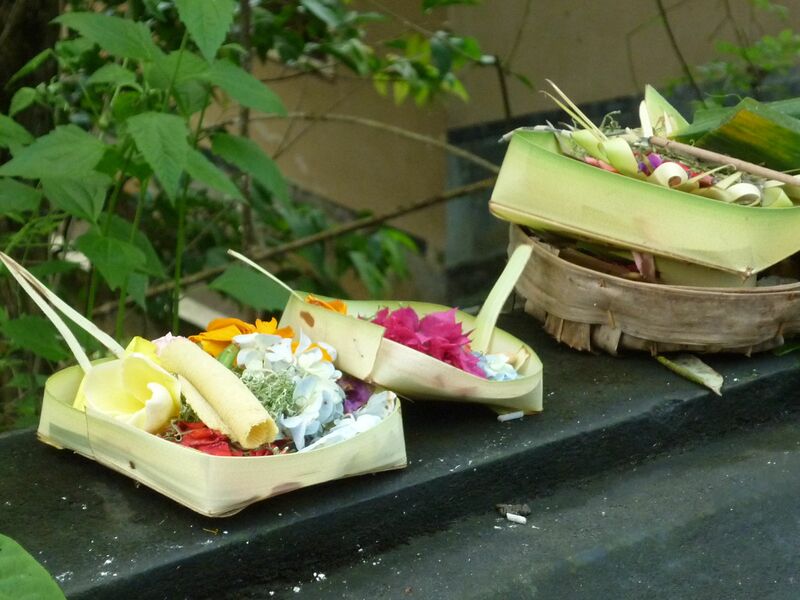 At the bottom of the statue, and really anywhere deemed appropriate, locals left offerings of rice and flowers placed in small boat-like baskets of woven coconut leaves. The offerings were a reminder that unlike the rest of predominantly Muslim Indonesia, Bali’s population is 93 percent Hindu. It didn’t take a brochure this time. Bali seduced for real. 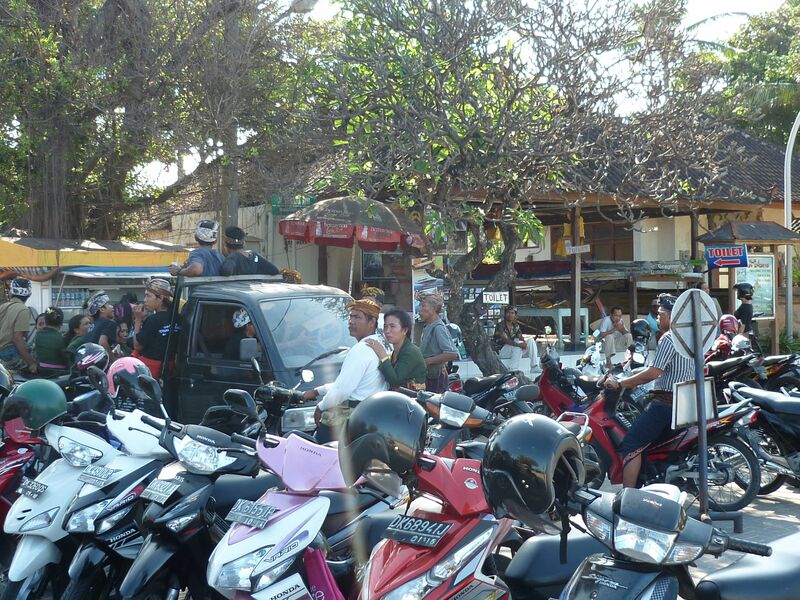 Bali delivered even with ordinary scenes of day-to-day life. And that is the business of Bali. It was easy to see why tourism represents 80 percent of the island’s economy. I could let go. After all, one doesn’t always have control of a situation. For instance, a loss of control could be riding in a Budapest taxi with a maniacal driver; attending an all-day summer concert in baking Paris with 150,000 people and absolutely no provisions; getting completely lost while mopedding in a remote corner of Greece; or warding off drunken imbeciles when confined in a minibus in Mexico. But in reality, these were adventures because I didn’t have kids at the time, and it all worked out. However, once you have kids, these types of scenarios are called letting go of your senses – being reckless and irresponsible. You tell yourself you’re the same crazy traveler of yore, but really, you are the person who, with your first infant, woke up every hour during the night to make sure he was still breathing. 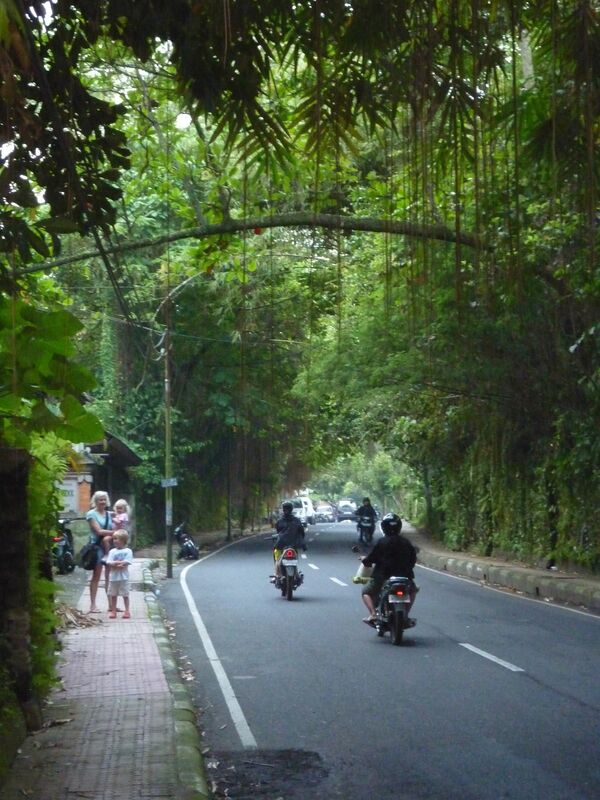 Soon, we ditched the strollers in Ubud. (The sidewalks were uneven, cracked, even ruptured in many areas and often they abruptly ended.) The sippy cups were next to go. Eventually, the kids were requesting Nasi Goreng, Bali’s national dish. Everything just fell into place. 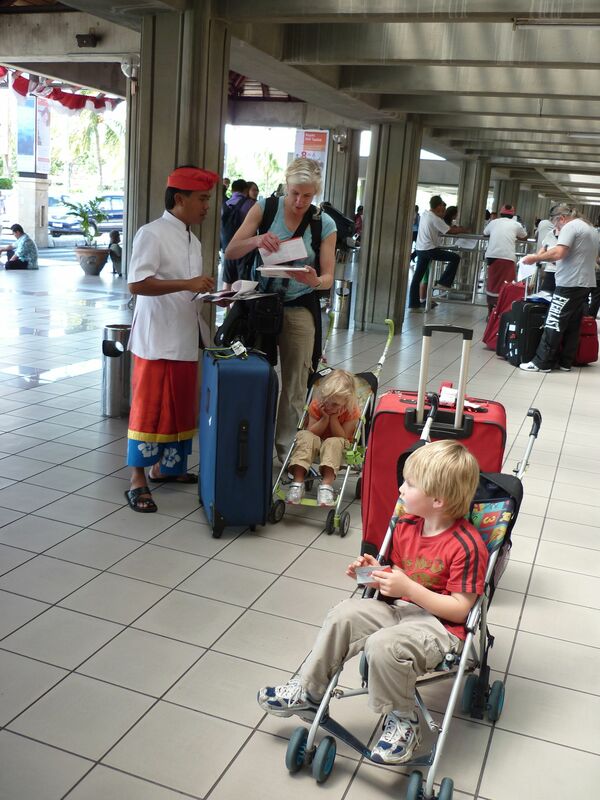 This entry was posted in Asia, Culture, Family Travel, Indonesia, Southeast Asia, Travel, Uncategorized and tagged Bali, car seats, Hindu, Neurotic Mom, offerings, peaceful, scooters, travel misadventure, Travel oops, traveling with kids by stephglaser. Bookmark the permalink. I think we have a mutual fan club going, Lottie, because I really look forward to seeing your posts — especially because they not only crack me up, or make me tear up (like the post about you working with the sick and elderly) but they have beautiful photos and great information about my favorite place. We had such a magical time in Bali (I totally mellowed out and quit being a such a freak about riding in vehicles with no car seats etc.) Yes, and the Nasi Goreng was delicious. My kids are not afraid to eat Asian food — I just always remind them that they loved the “Bali noodles,” and they say, “Oh, yeah.” (Kasey also loves Vietnamese Fa.) 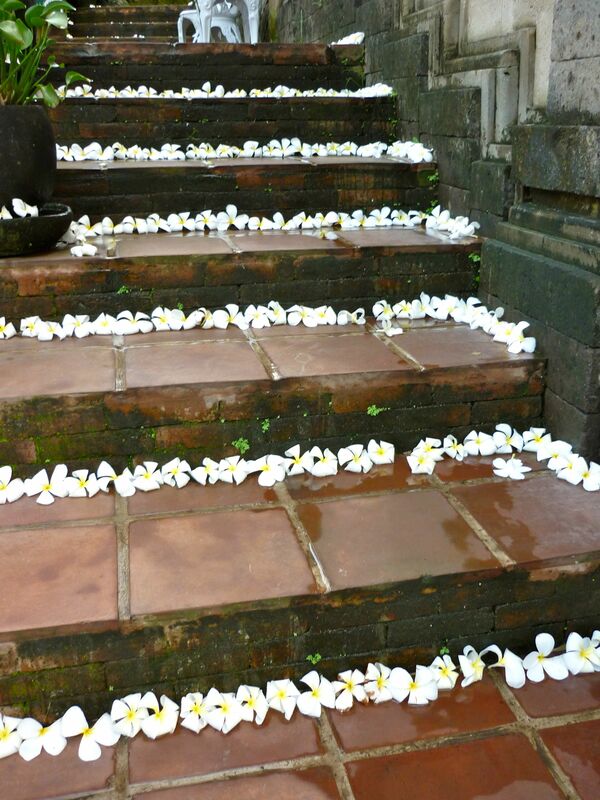 I’m so happy we could take them with us on the trip — they still have some vivid memories of Bali. Thanks Steph. we definitely have a mutual admiration society thing going! I thought of you the other day when I was at bali airport and passed the spot where you had the photo taken!! see, you are even in my thoughts when i’m not even on WP!